This is the year you’ve decided to throw a holiday party, but you’re filled with angst and questions: What to serve? Who to invite? How to set the table? Where to begin? Take a deep breath. We’ve got you, and your table, covered. We’ve asked the experts — seasoned entertainers, caterers and designers — for ideas about how to throw a fun holiday party. In these days of Pinterest and online potluck sign-ups, you can certainly get lots of ideas for every step of the party process, from planning the menu to learning the lingo. For instance, what’s a charger? A clue: It’s not for your cell phone. More questions: Do you want to have a casual gathering of a dozen besties or a formal affair for 200. Do you want a DIY-party or one with caterers, bartenders and bands? Do you want to carry on family traditions or try something different? Where to start? Look in the mirror. Even if you can’t do any of those things, she said, “maybe you’re just a delight to be around and your friends love you anyway. So, take a moment to soul search about what you, pun intended, bring to the table.” For starters, you don’t have to bring perfection. “Don’t overcomplicate it,” said Laura Johnson, founding artist and CEO of Tallahassee-based Coton Colors. Jewelry artist Quincie Hamby has embraced this philosophy to create warm gatherings without the hassle. “I work full time and I like to entertain, but I don’t worry about my house being completely decorated,” said Hamby, whose jewelry creations are featured at Wish Boutique in the Glenview Plaza. She’s a hostess who loves to cook, but she may supplement her menu with dishes made by friends. Experienced entertainers agree that your attitude is more important than the fanciest decorations or ingredients. Jansen plans months in advance to pick a theme, decorate and work with a caterer and friends to create a festive occasion. “It’s been wonderful,” said Jansen. Business-management consultant Lisa Miller has been hosting holiday parties for a dozen years, but five years ago, she began dedicating her celebrations to Last Hope Rescue, a volunteer group that finds homes for pets, particularly those in danger of being euthanized. “It’s truly a labor of love,” said Miller, owner of Lisa Miller & Associates. About 20 friends and her husband, Jerry, help her decorate 12 trees and the house, prepare all the food and find items for a silent auction to benefit the pet-rescue group. Last year, the party raised $5,000 and collected 75 bags of dog food. The “ticket” to the party is a bag of dog food of at least 50 pounds or other pet items. To pull it off, Miller and friends start planning in early November and hold the party in mid-December. Even if you’re hosting a more casual wingding, don’t wing it, entertainers advise. To help you throw a holiday party that you’ll enjoy as much as your guests, here are tips gleaned from the experts. Pick the date. Are you celebrating a specific holiday or the season? Keep in mind that in 2018, Hanukkah starts at sundown Dec. 2 and Kwanzaa on Dec. 26. Fridays and Saturdays book up quickly from Thanksgiving to New Year’s Eve, so if you’re not planning a family-focused event, you’ll want to reserve your date early. Consider the option of a Sunday afternoon fete. It’s easy to sweat over the guest list. You may want to reciprocate for every invitation you’ve ever received in your life, but don’t be overambitious. Keep in mind that a great group of guests can overcome calamities like a fallen soufflé or a rain-soaked patio. “Instead of inviting every human you know, invite the ones you truly want to spend time with,” said Bright McMullen of KitchenAble. For a large gathering, the size of your soiree is likely dictated by how many people can fit comfortably in your home and usable outdoor space. For a cozier dinner party, you can limit your guest list to the number of people you can accommodate at the table, or make it a buffet. Adding a nicely decorated small table can help expand your list. Do you need to send out invitations? Options include email invites, personalized if possible, or snail mail. Calls work for a small, informal party. Jansen, co-owner of FIT, still prefers to use regular mail to get the word out. Your invitation can reflect the mood or theme of your party, if you want a theme, that is. This can be another one of those party conundrums. You want to do something creative but not too weird or overdone. A piece of advice: Let someone else have the ugly sweater party this year. For some entertainers, the theme is simply the joy of the holiday, with festive decorations that set the tone. If you want to build on that, you can certainly tap Pinterest or the internet. You’ll find ideas such as the “Nightmare Before Christmas” party, the holiday movie marathon, the spiked hot chocolate-sipping event and Christmas tree-trimming get-together. The inspiration or theme can be seasonal or an ingredient — flowers blooming in your garden, for example. Or it can be as simple as a beautiful piece of china from your grandmother that you like to pull out during the holiday season, she said. “The whole party doesn’t have to be focused on that theme, but it’s a launching pad,” said Bright McMullen, who recommends clipping magazine recipes and decorating tips for future ideas. Jansen starts planning themes months in advance for her popular holiday parties. Last year, the theme was “Christmas in New York.” “Our menu had tiny pastrami sandwiches and chicken lo mein noodles served in miniature takeout boxes. “If it’s a small dinner party, decide what you want the feeling of the party to be — casual and cozy or maybe small and festive — and then pick recipes, flowers, table settings and a playlist that sparks that feeling,” she said. Remember that when you’re planning a party, checklists rule. Make shopping lists for food and beverages, decorations and supplies. Make lists for what you need to do in the weeks and days before the party and your day-of schedule. And then remember to look at the lists. If you’re getting a caterer, word-of-mouth recommendations are best, but also look at the firms’ websites to peruse their recipe repertoire. You’ll want to book a caterer as soon as possible, and be realistic about the cost. Consider whether you’ll want a caterer to bring plates, flatware and serving platters. Some home cooks expand their menu by ordering premade plates. “If you order from stores, you have to order at least a week or more in advance,” said Hamby, the jewelry artist. “It’s OK to supplement what you cook yourself.” Hamby’s holiday party menus typically feature seafood dishes, including bouillabaisse, shrimp and grits, paella, salads with anchovy dressing, and oysters (grown in Apalachee Bay by OysterMom’s Deborah Keller). Mark Suber, chef/owner of the Black Fig catering company, suggests offering some room-temperature dishes that can be prepared ahead of time, such as sliced beef tenderloin and smoked salmon. Other top make-ahead choices are charcuterie and cheese boards and antipasto platters or even a big, festive salad. Tradition dictates some holiday fare. Hanukkah dinners will typically include fried foods “because the oil symbolizes the oil that lit the menorah,” said Stefanie Posner, education and music director at Temple Israel. “My family ate fried chicken” for Hanukkah, said Posner, who teaches cooking classes at the temple. Potato latkes or pancakes and jelly doughnuts are popular Hanukkah dishes. If you’re looking for unconventional additions to your holiday party menu, consider “featuring a little bit of culinary diversity,” said Beverly Rich, chef and co-owner of Klassic Katering with her husband, Lincoln Rich. “It adds a wow factor and broadens your guests’ palates. Food and culture bring us together. She often recommends Mediterranean-inspired dishes, with seafood and fresh vegetables as well as curries. If your family loves sweet potatoes topped with marshmallows, you can add some varied sides such as Brussels sprouts, root vegetables and roasted potatoes with bacon and rosemary, said Suber, of Black Fig. Some time-pressed entertainers are turning to SignUpGenius, an online service to help coordinate sign-up lists. As for beverages, spiked eggnog is a tradition, but also consider a signature cocktail or two, along with wine and beer. Don’t forget craft beer from Tallahassee breweries. For your teetotaling friends, provide some options to water and soda, including hot apple cider, iced tea and non-alcoholic cocktails. Decorating the table is one of the most exciting elements of throwing a party, but first more decisions. Do you dig out your crystal, linen tablecloths and fine silver, or do you consider disposable cutlery and plates? “You should definitely pull out your fine china,” said Lauren Teal, owner of the My Favorite Things boutique. “What are you saving it for? If you can make memories with your pieces, then that’s what will be passed down from generation to generation. As for new additions, gold, bronze and copper silverware are gaining popularity, and so are creative chargers, she said. Chargers are decorative plates placed under your dinnerware that add a more formal touch to your table setting. Local design expert Everett Thompson also suggests getting your nice things out of the cabinet or closet. 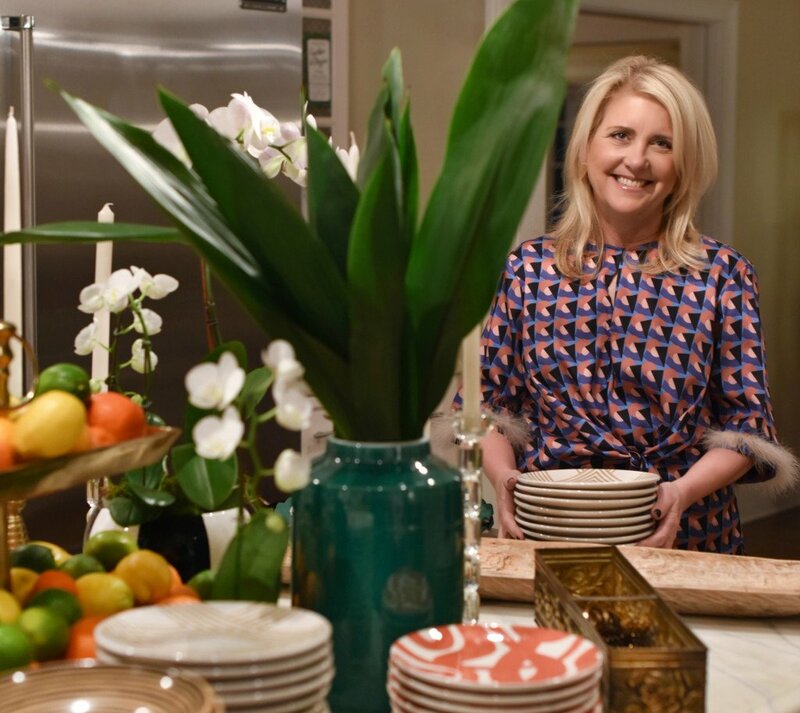 Business management consultant Miller said she uses sterling silver, crystal, china and silver flatware at her large parties “and I’ve never had one china plate broken,” she said. Hosts who don’t have the fancy stuff or don’t want to use it for a huge dinner party often opt for paper or plastic. Green-minded entertainers are using trendy biodegradable products such as plates made from bamboo or fallen palm leaves. When it comes to the centerpiece, anything goes. Designers are turning to nature for inspiration, using real plants and greenery to brighten tables. Thompson suggests combining greenery and ornaments in a large, decorative bowl. Spraying branches or stacking pine cones, plentiful in Tallahassee, in a tall glass vase also adds an elegant touch, said Rich, of Klassic Katering. It may sound like a lot of work, but don’t sweat it, said the experts. Throwing a holiday party is ultimately about sharing a joyous time. Do you have enough dishes, flatware and glasses? If not, you can rent them, though that can be expensive. Shop around for the best deals. Provide drinks in one area and the food in another, with plenty of space around. Stephanie Jansen, co-owner of FIT, suggests placing plates of finger food, napkins and decorative trash cans around the house.